Made by one Alfred Brock of Stockholm, Sweden in 1919 this lute came into my workshop for repair. 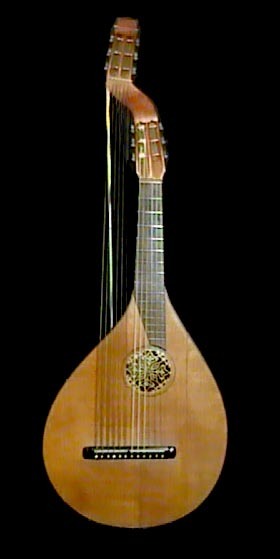 A Swedish Lute is a specific instrument - not just a lute made in Sweden. It has a guitar style six string neck with an additional six bass strings - the metal bar running from the second peghead to the body is just to add some strength. I'm not sure of the correct tuning for it - nor can I play it properly.I think it has a sound of its own and I love the peghead design. Here's a short video of me trying to play the Swedish Lute.